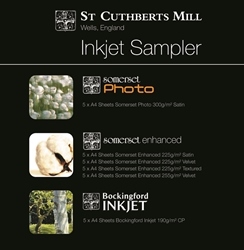 St Cuthberts Mill based in Somerset, England specialises in the paper manufacturing of high quality artists papers. The experienced papermakers carefully make professional mould made papers, using one of the few remaining cylinder mould machines left in the world. Digital inkjet/giclee printing has become a method of re-creating original works, but also for incorporating mixed media pieces of art. 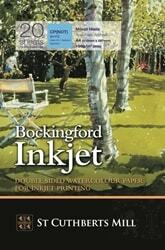 Bockingford Inkjet is the answer for artists who wish to create their own limited edition prints. Fantastic prints can be reproduced to look like the original, when using a good inkjet printer. Bockingford Inkjet is made in the same time-honoured fashion as Bockingford watercolour paper using a traditional mould machine. Bockingford Inkjet has an ink receptive coating on both sides of the sheet, allowing limited edition books and portfolios to be created. For artists who wish to create their own limited edition prints. A very economical way of testing different sheets of Bockingford and Somerset Inkjet papers. See product details for contents of sample pack.